Our professionals can help fit you into a pair of contact lenses that is just right for you. We are experts in fitting contact lenses and can handle the most specialized needs. Whether rigid, soft, toric or multifocal, we are experienced in handling the most difficult of prescriptions. If you have allergies or dry eyes, then you know these conditions can be particularly annoying to contact lens wearers. In the past many people had to quit wearing their lenses because of these conditions. However, new lens materials and allergy medications have made it possible for these patients to eliminate the burning itchy eyes associated with allergies and dry eyes. 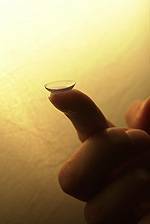 The latest advancement in contact lens technology is the use of Silicone Hydrogel material. The silicone based material allows for more oxygen permeability to the eye for better corneal health and increased wettability for better comfort. Many of the newer lenses also use wetting agents to increase moisture retention of the contacts. Be sure to ask your doctor which lenses are best for you. If you ever fit the criteria for a study, we will notify you. Patients are often times reimbursed for participating.